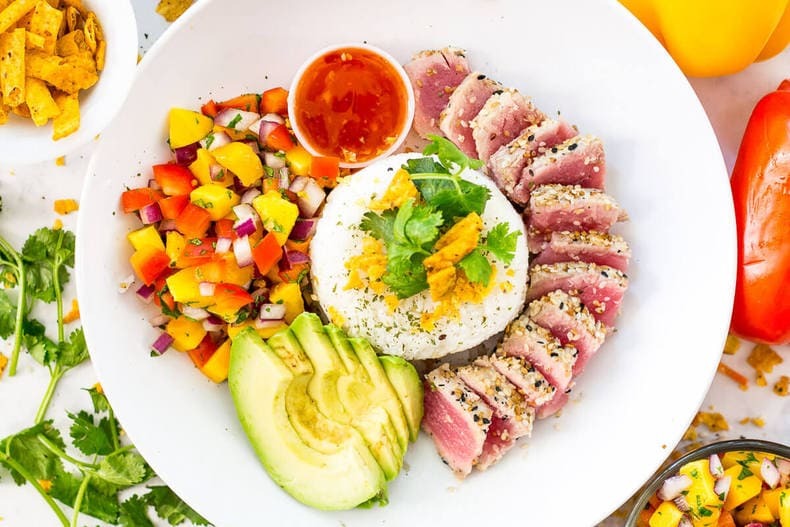 These Bonefish Grill Tuna Bowls are a delicious copy cat from my favourite seafood chain – be sure to add sliced avocado, mango salsa and sweet chili Thai sauce for extra kick! 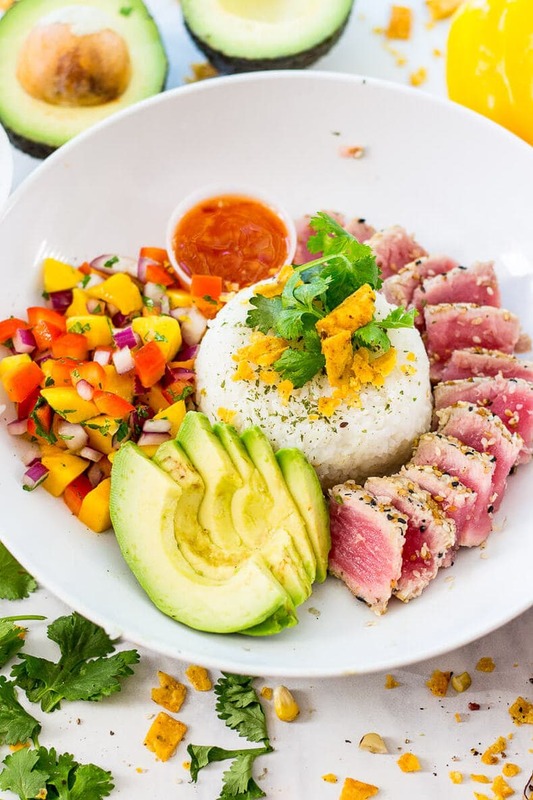 These Bonefish Grill Tuna Bowls. Holy crap, have we ever got a problem here. See, tuna steaks are already my favourite. And I already can't afford to buy them more than a couple times a year. But I am literally SO HOOKED on these tuna bowls it's insane!!! Well, I mean, you could be responsible and splurge only a few times a year. That would probably be the right thing to do. 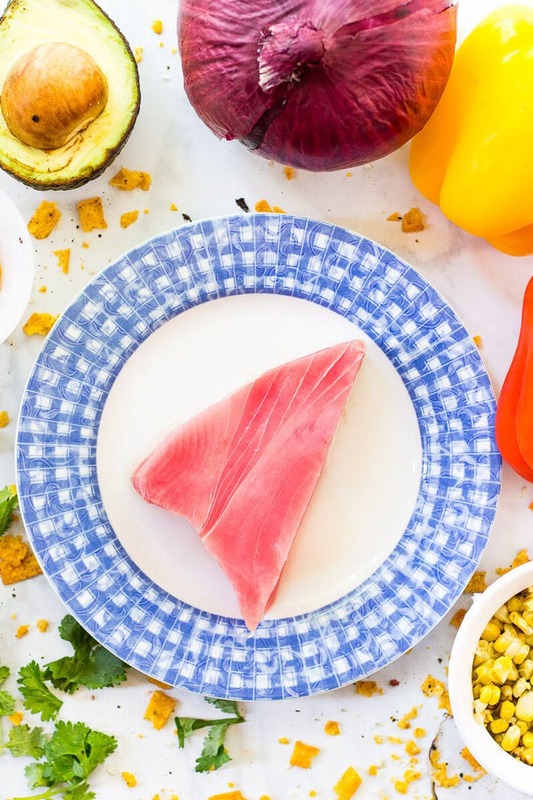 You could also possibly even substitute the tuna steaks in this bowl for a cheaper alternative like salmon, or you could buy frozen tuna steaks (though I don't recommend! ), or you could even borrow from my favourite spicy shrimp stacks recipe and saute some shrimp up here for a deconstructed version. But when you discover a new favourite this good, sometimes you have to go all out – often. I mean, it's kinda cheaper than going to a restaurant? If you don't know by now, I'm honestly kind of obsessed with Bonefish Grill. Before I started working on this food blog before time, you should know that I considered myself a bit of a professional eater. Instead of recipes, I mainly reviewed restaurants in and around Toronto. It was actually kind of a fantastic gig if you could figure out how to make money from it. 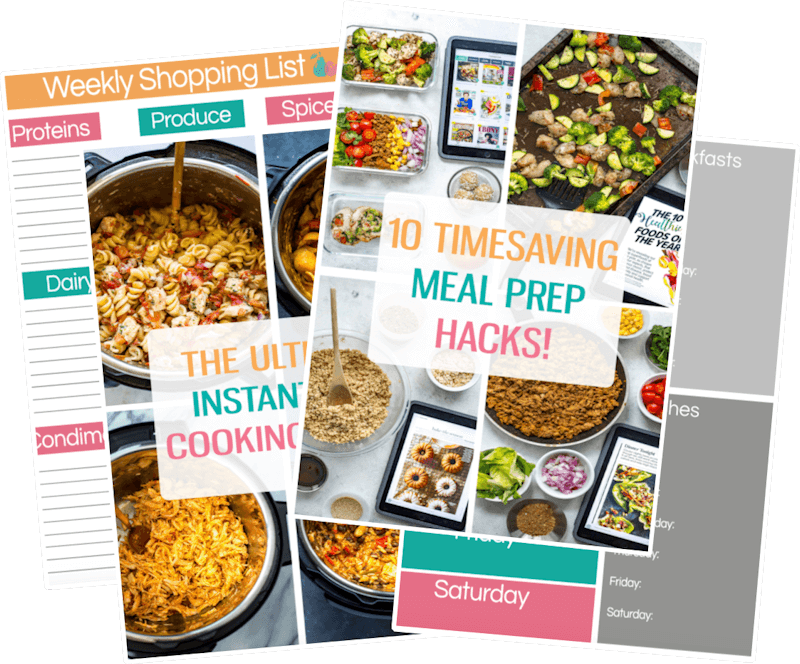 I was able to eat a lot of food for free in exchange for reviews, but obviously over time this gave me problems for my waistline and I found I had trouble giving completely honest feedback since the reviews felt so transactional. Of course, 99% of what I ate was usually delicious and it just further cemented my understanding of independently-owned and operated restaurants as far superior to any restaurant chain out there. Yet despite all this, Bonefish Grill has a special place in my heart. And I should add that this isn't my first attempt at a copycat of one of their menu items – my mom's favourite Bang Bang Shrimp Tacos are nearly a monthly (okay, weekly) staple on our dinner menu at home. 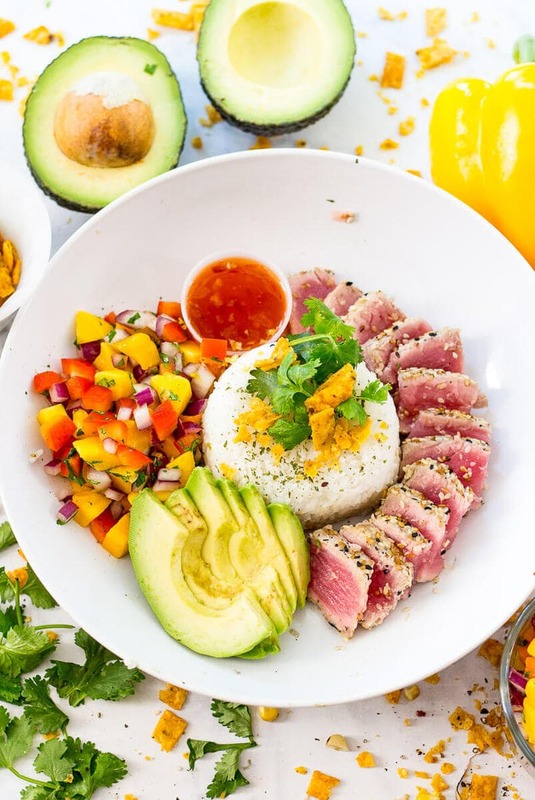 Okay so I gotta know…will you be making these Bonefish Grill Tuna Bowls? If you try any of my recipes be sure to let me know on Instagram, Twitter, Facebook or in the comments – I'd love to see what you come up with! In a rice cooker or in a pot on the stove, cook rice according to package directions (usually it takes around 15-20 min). 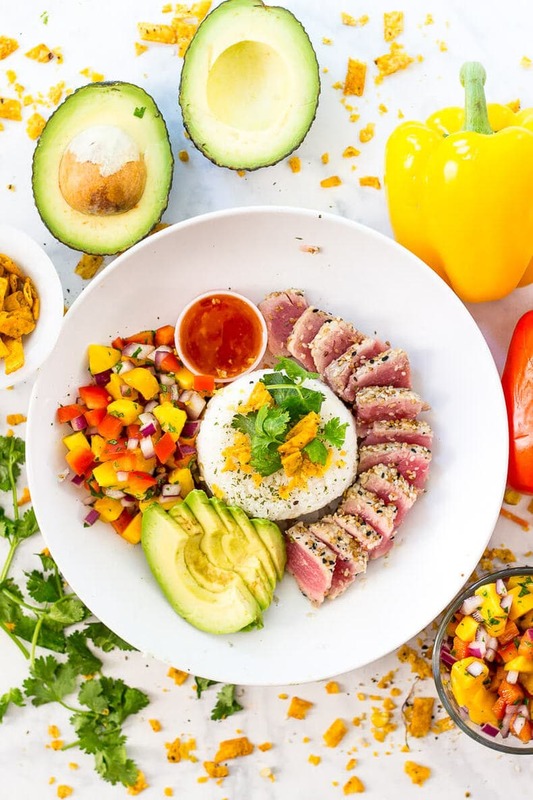 Meanwhile, make mango salsa and coat tuna steaks with sesame seeds. Heat olive oil in a large frying pan on high heat. 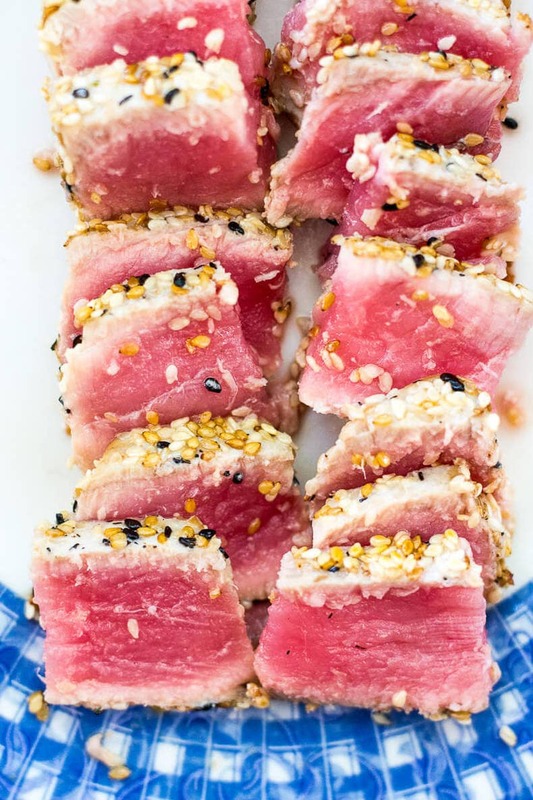 Once oil starts to smoke, add tuna steaks, cooking for 45 seconds per side. Remove from heat and set on a plate to rest for a couple minutes. Pack rice into a 1/2 cup measuring cup and dump onto each plate. 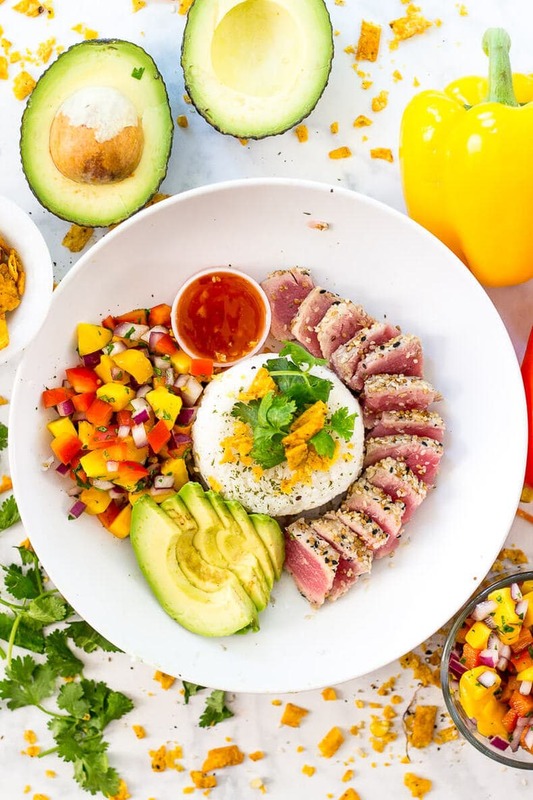 Add mango salsa alongside rice, as well as sliced avocado. Add half of each tuna steak to each bowl. Garnish with crushed tortilla strips and cilantro, then serve along with a tiny bowl of sweet chili Thai sauce for dipping. Enjoy! These bowls are to die for Taylor!! Oh MY!! 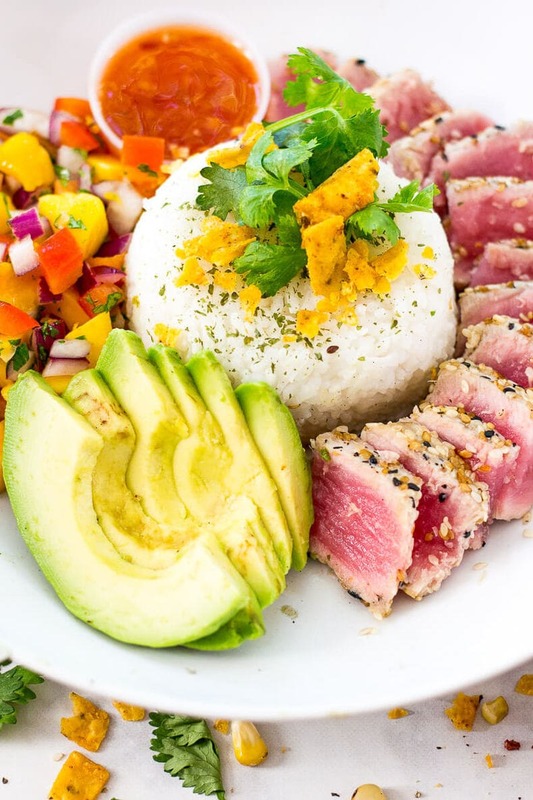 That tuna looks simply perfect! Yum! Thanks so much Mahy!! I wish I could afford to eat fresh tuna more often! Gorgeous colors and looks absolutely stunning. Replicating the recipes at home have always been a pleasure for me. This recipe is dead on. 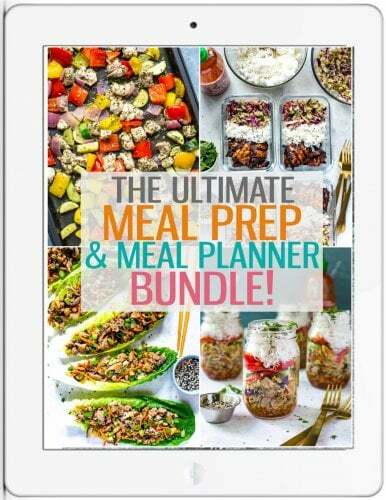 So delicious and easy to prepare. Thank you so much Taylor.